OTTAWA, Canada -- Ukraine’s envoy is urging Prime Minister Stephen Harper to push his fellow G7 leaders into a strong political stand against the latest Russian aggression, but says his country can make do without weapons from the West. 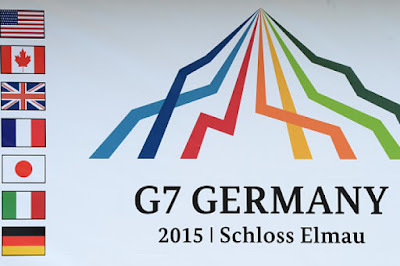 The sign of the Elmau G7 summit is pictured in the small Bavarian village Klais, southern Germany, at the access road to Schloss Elmau Castle near Garmisch-Partenkirchen on June 1, 2015. 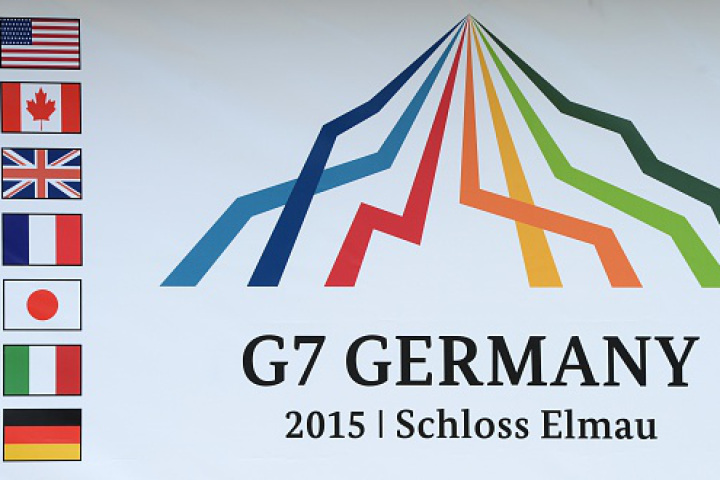 Germany will host the G7 summit at Elmau Castle on June 7 and June 8, 2015. Prior to the G7 leaders’ summit in Germany getting underway Sunday, Harper departs today for the Ukrainian capital of Kiev, where he will find himself in a country gripped by renewed violence. Five Ukrainian troops were killed Wednesday in a violent outbreak that witnesses say involved the deployment of heavy artillery on the Russian side – an apparent violation of the earlier Minsk ceasefire agreement between the two countries. Reports on the number of Russian-backed rebels killed vary considerably. Donetsk-based rebels reportedly said 14 of their troops were killed; the Ukrainian military said their enemy’s death toll was 80. Marko Shevchenko, the Ukraine charge d’affairs to Canada, said more sanctions would be one measure that Harper and his fellow leaders might come up with in response to Russia’s latest provocation. But he said it isn’t necessary for Canada or its allies to provide lethal military assistance to Ukraine forces. “We understand this is a sensitive question. We understand it should be a consensus among our western allies and partners,” Shevchenko said Thursday in an interview prior to Harper’s departure. Harper said as much that same day when asked whether he thought Ukrainian forces should be given weapons by the West. Shevchenko praised the efforts of the 200 Canadian Forces personnel in Ukraine who are training the country’s forces. “The Canadian government, led by Stephen Harper, is the world leader in providing such non-lethal assistance to Ukraine,” he said. Shevchenko said the expertise of Canadian military trainers comes from the country’s extensive combat experience in Afghanistan, and far outstrips the capability of his country’s own forces. “The Canadian Armed Forces have big experience in contemporary war,” he said. The Ukrainian military needed tactical training to overcome initial problems in that area, said Shevchenko. Shevchenko said the capture of two Russian special forces soldiers and the death of several Russian military personnel on Ukrainian soil make a mockery of the denials by President Vladimir Putin that his country is behind the aggression. “If there’s a civil war in Ukraine, why do coffins go to Russia in this civil war?” he said. Harper and his fellow G7 leaders will be seized by the ongoing Ukraine crisis, which is experiencing a new flashpoint in what has been an uneasy ceasefire with the outbreak of hostilities between Ukraine forces and Russian-backed rebels. Harper will meet President Petro Poroshenko and Prime Minister Arseniy Yatsenyu on what will be his third visit to Ukraine since the outbreak of violence last year. Poroshenko told his country’s parliament Thursday that a “colossal threat of the resumption of large-scale hostilities by Russian and terrorist forces” loomed in his country’s east. He said there are now 9,000 Russian troops in the rebel-controlled area. Canada is also giving financial assistance to Ukraine to help it build its struggling economy, which has been beset by corruption. Canada’s help includes $202 million in development assistance and $400 million in low-interest loans. “We see a necessity to support Ukraine financially, and it’s not only just paying for their gas bill, the economy is a mess,” said one senior European G7 government official, who spoke on the condition that they or their government not be named. The official said the way Russia acts has contributed to problems in Ukraine, but the country needs to clean up its own corruption and mismanagement problems.